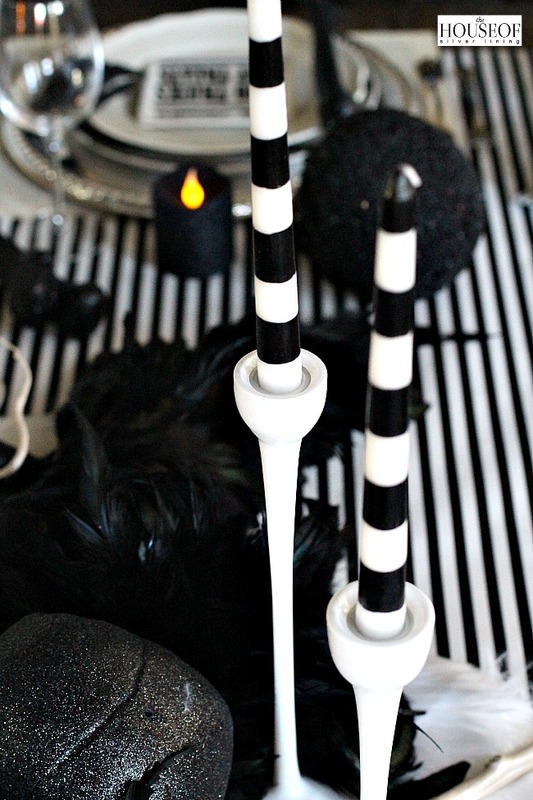 For my Halloween decorating this year I wanted to keep a black and white theme throughout my home. 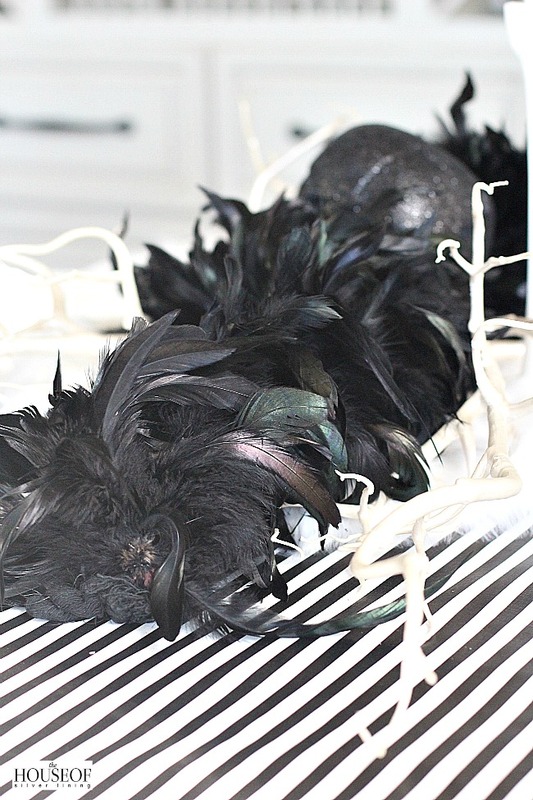 I didn’t quite know what direction I wanted to go with my halloween tablescape until I came across this black iridescent feather boa. I love the whimsy look of feathers and thought they would add an elegant touch to my eerie halloween table. The candles are from Michaels and the candle holders from Ikea. I think I’m going to go back to Michaels and buy up all of these fun candles. So festive but could be incorporated into my decor year round. 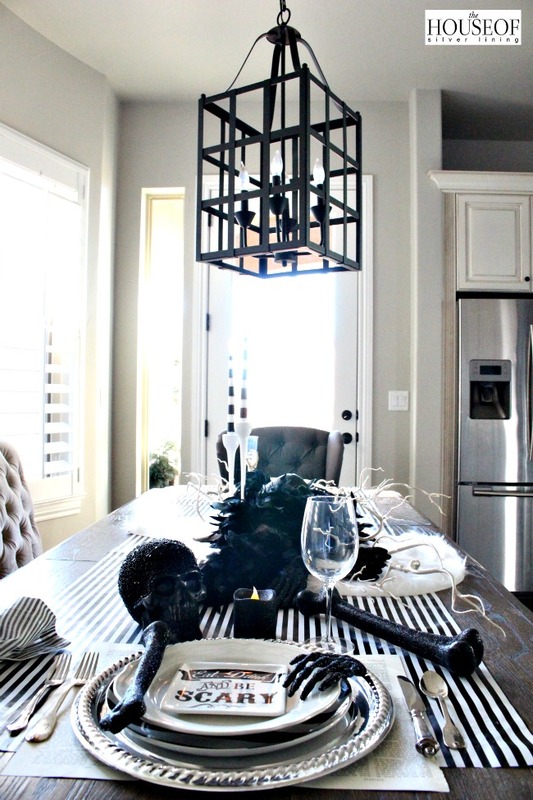 My black and white theme was first conceptualized when I created this fall tablescape. 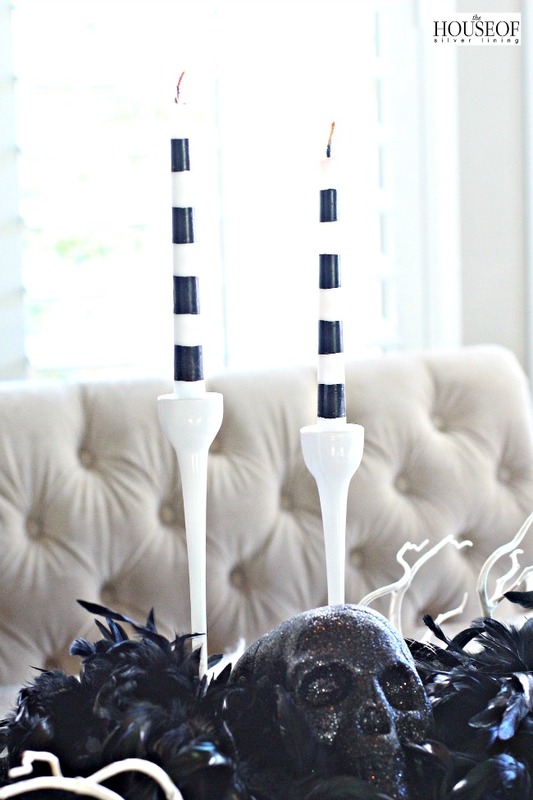 I used black and white striped wrapping paper from Homegoods as my first layer. Then I added a white fur from Homegoods for some texture. The white branches I found at Ikea. 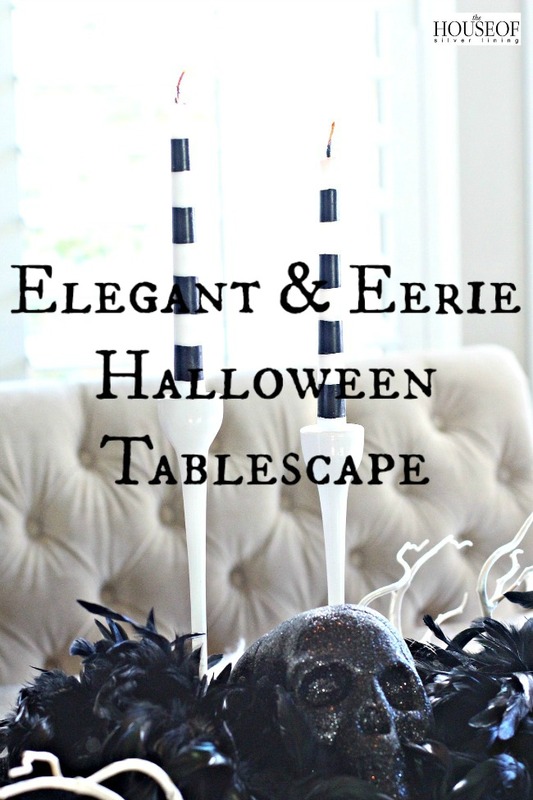 I have a thing for branches and knew these would be so fun to incorporate into my halloween decor! When the sun shines on these feathers they have this beautiful iridescent hue of green and deep purple. 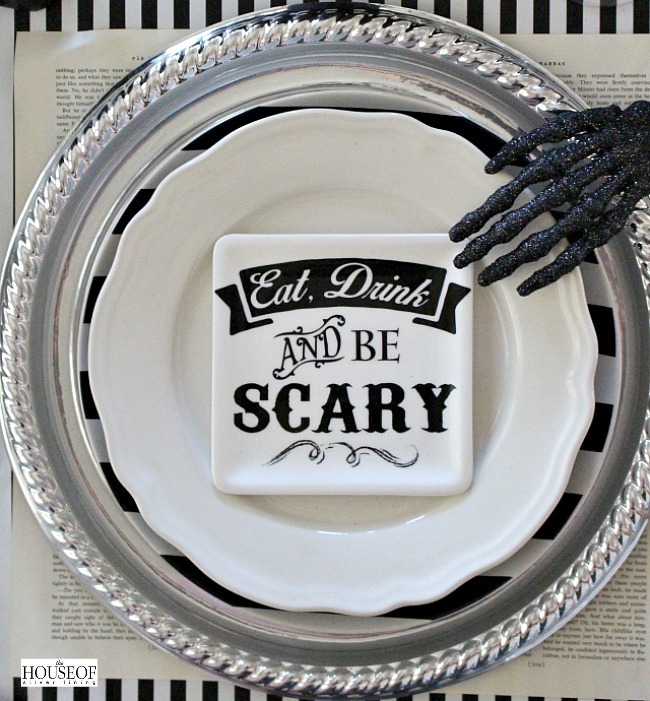 My place settings were created from book pages, dollar store platters, and Ikea and Homegoods plates. 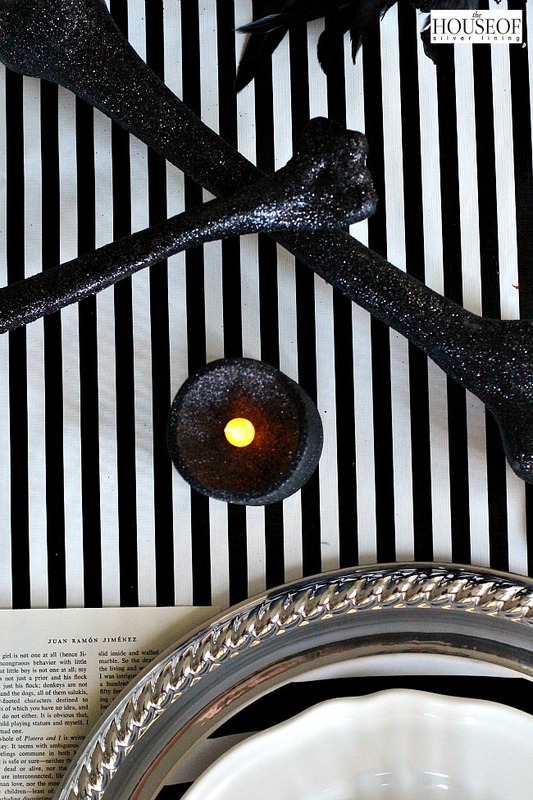 You can read about the details more in my moody halloween place setting post. 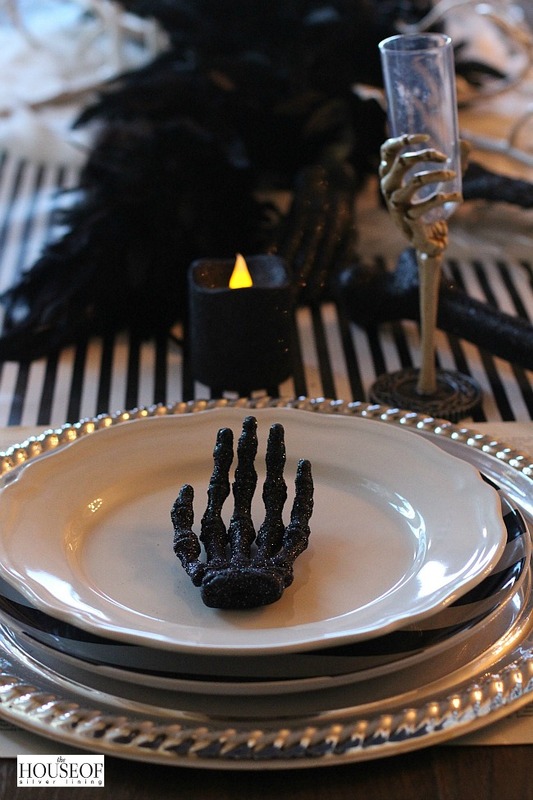 My flatware is from Pottery Barn which is oh so perfect for this elegant and eerie look. I love the engraved black script! 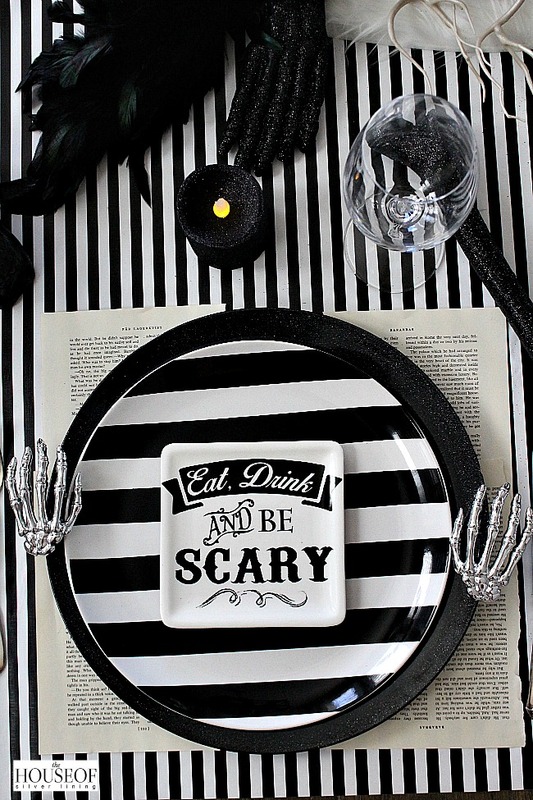 I try not to keep my place settings “matchy matchy” by having different wine glasses as well as a skeleton hand on one plate but yet only creeping onto another plate. I switched out my dollar store “silver” platter here with a serving tray as my charger piece. 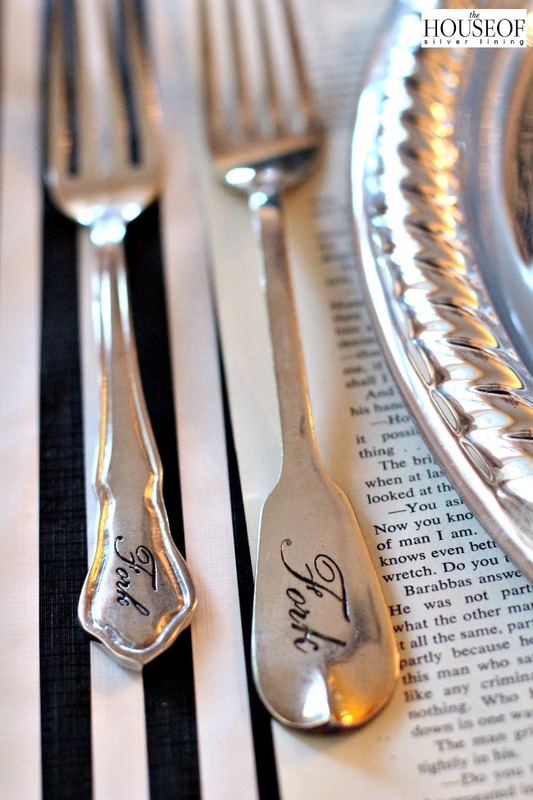 Mixing it up adds interest and allows your guests to have fun choosing which place setting they want to sit at. 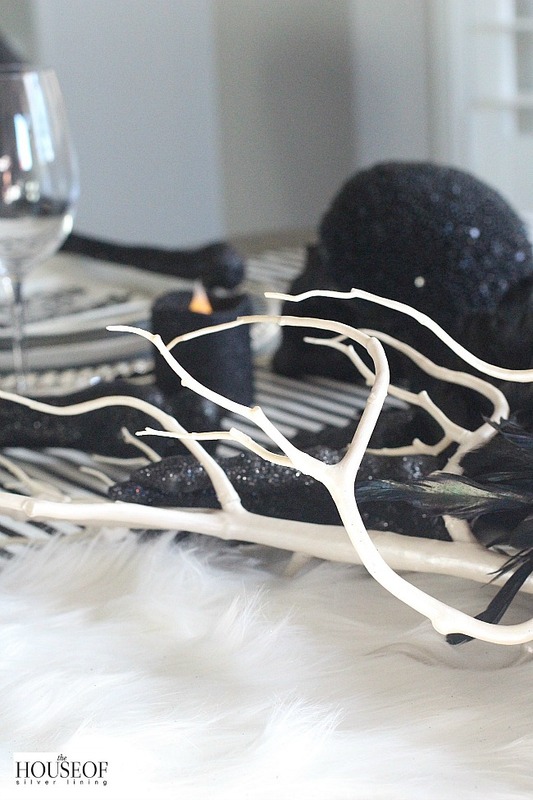 The great thing about the elements of this tablescape is that I can use the feather boa next year for my costume and the white branches can be used in my upcoming Christmas decor. 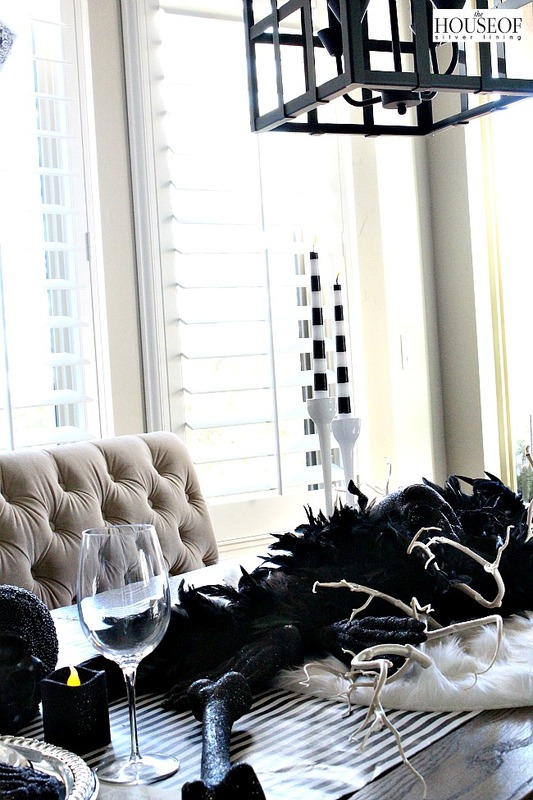 I love to reinvent my decor every year in a new way! 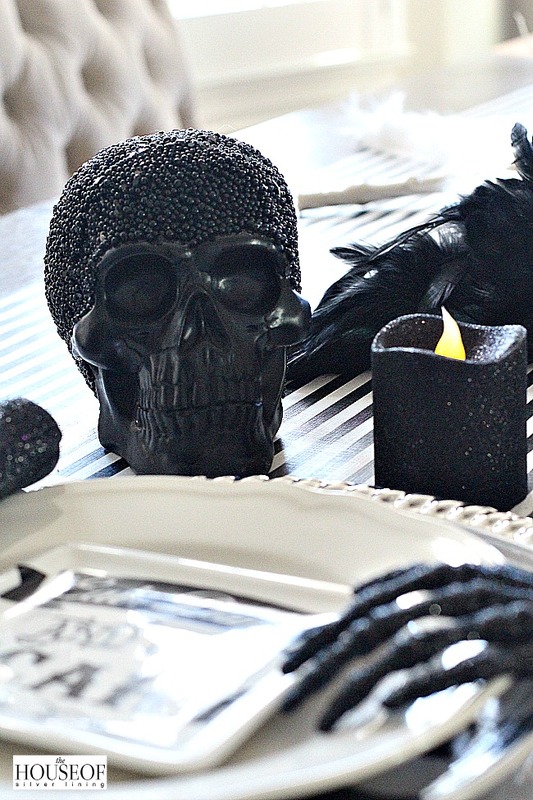 Black and white decorating is turning out to be my favorite halloween look so far! « Bring the Wallpaper Back! Thx Bree! I saw those white branches at Ikea and couldn’t resist! Wish you could come to the halloween bash too! 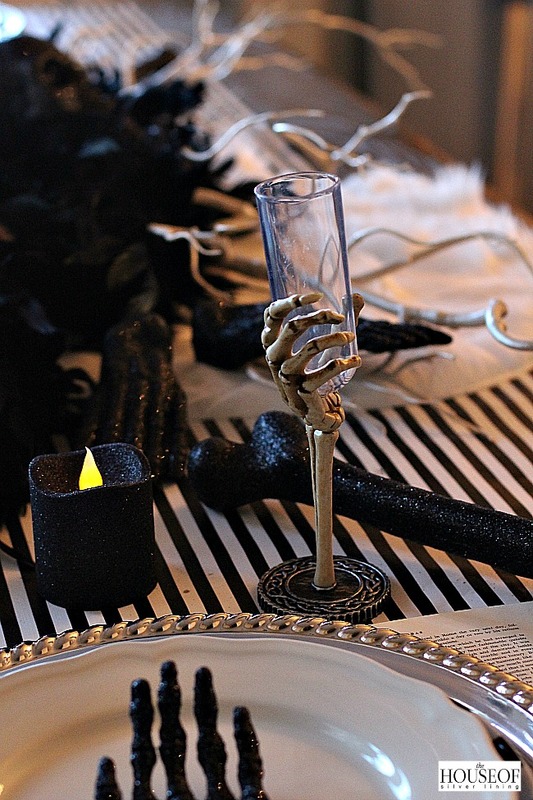 Shauna I love everything you did here for your Haloween Table setting 👏👏👏 Love black and white and how glam it was but still with that scary Haloween elegant touch you added 🙌 Bravo!! Thank you Melody! It was super easy to throw together this year! 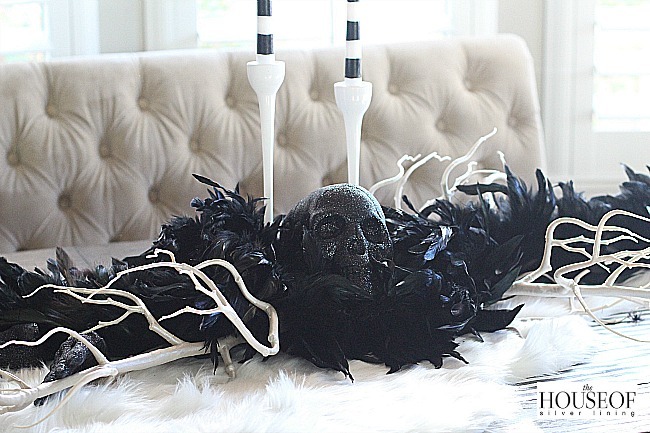 I just can’t get over that black feather boa! 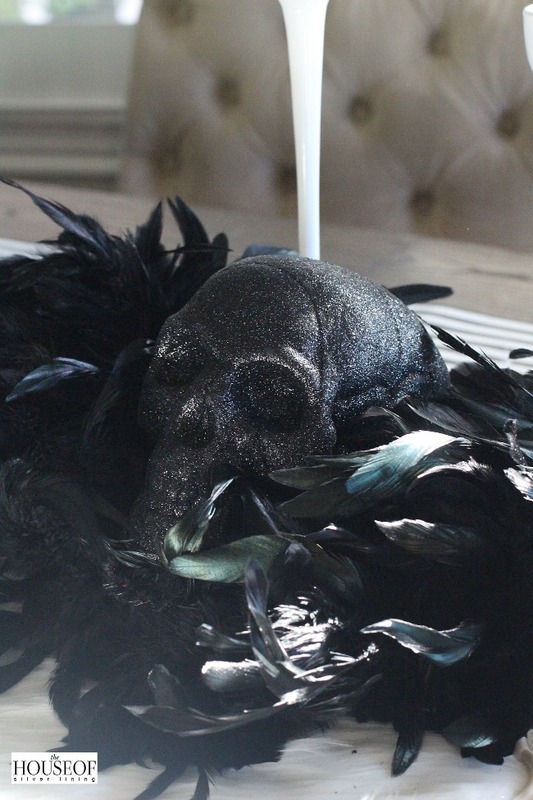 That’s what happens when I go to Halloween City for my Halloween costume and of course I buy items for decorating! LOL! It’s all about the decorations! So fabulous Shauna!!! I’m so excited for you Halloween bash! I can’t wait to see what you do! Thx Randi! I wish all my instagram buddies like you could come to the halloween bash! Would be so fun!! 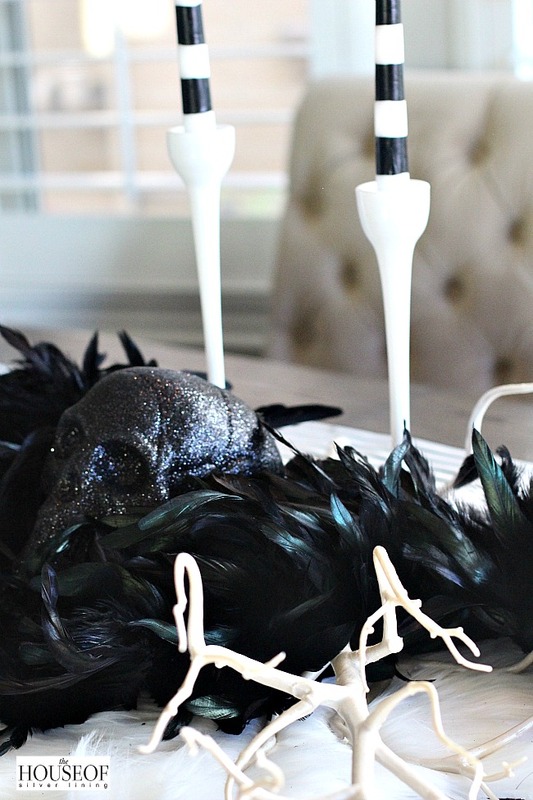 Love all of your Halloween decor! Very stylish! And I love the fact that everything you used was affordable for us frugal folks lol. Thank you Oscar! 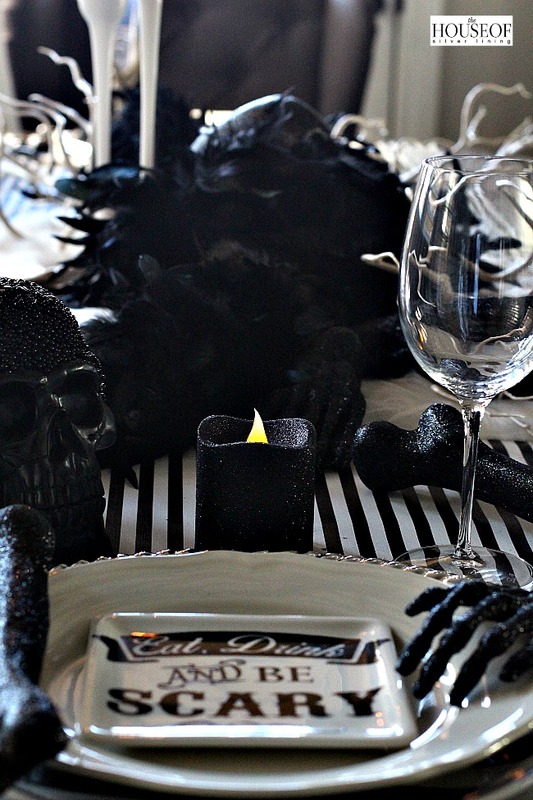 I’m still WOWING over your halloween tablescape! Loved it! Thank you Erin!! You are always so sweet!! 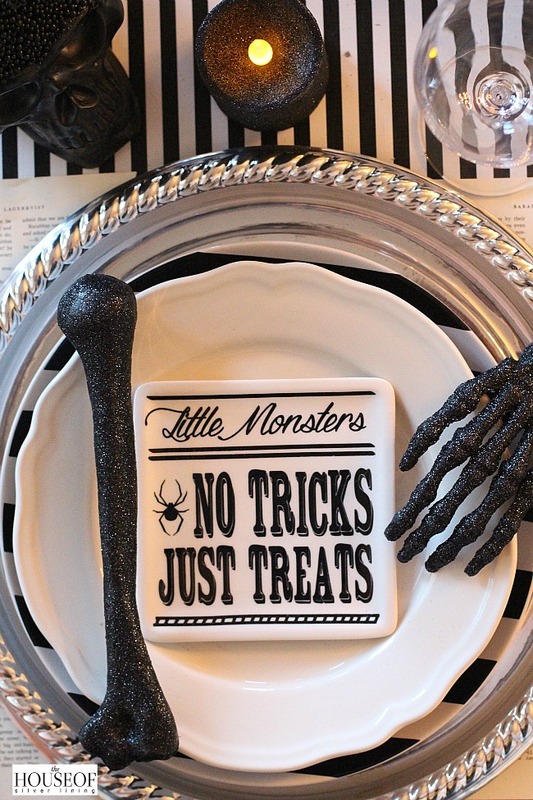 Hope you’re halloween is full of fun this wknd!